A library of podcasts & videos so you can learn when it suits you. Use the app to scan a QR code at an event, or manually input your training activity and your points will be instantly uploaded to your training register. All your CPD activity is automatically collated into your personlised training register. Email and print with a click of a button. Use the app to scan a QR code at a CPD event and your points will be instantly updated to your training register. Manually input and manage all your CPD activity in the one app. All your CPD activity is automatically tracked in your personalised training register. View and print with a click of a button. Set the date range for your CPD reporting period. Recall historical training registers. 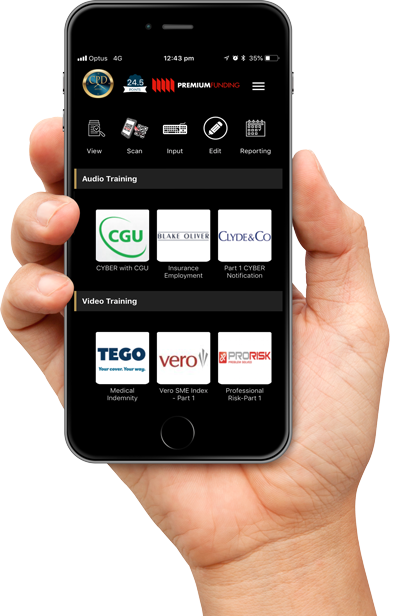 "I loved the concept of the CPD Anytime App from the moment I saw it. Using technology to make brokers’ lives easier is something I am passionate about and why Premium Funding supported the app"
Our vision is to provide a centralised platform for insurance professionals to easily access accredited content and record their professional development; using technology that’s literally in everyones hand. If you have any questions about CPD Anytime or require further assistance, please complete the enquiry form or call the number below.